We have no banner ads and no popups on turnstep.com. Please help keep it that way by supporting out sponsors, and let them know this is your favorite site. ORIGINAL ARTISTS! ALL 32 COUNT! Work This! Music offers emotional, energy-charged, motivational original artist fitness music that fills the needs of fitness instructors, presenters, industry professionals -- and anyone who is into working out! Work this! 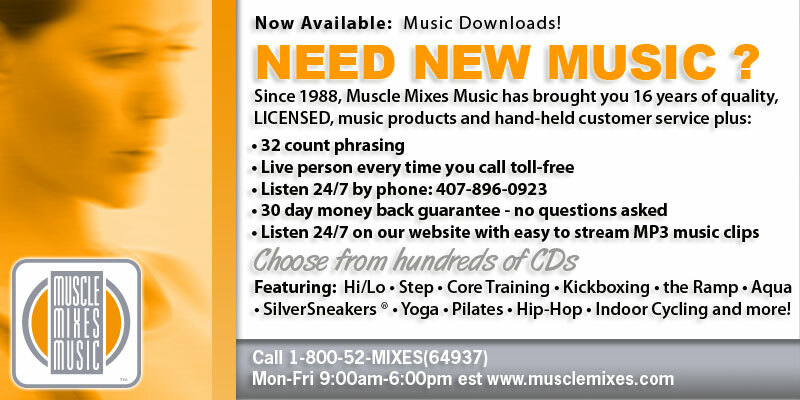 Music is the only fitness music company that uses music performed and recorded by THE ORIGINAL ARTISTS!! No Crap Cheesy remakes -we offer the real deal! 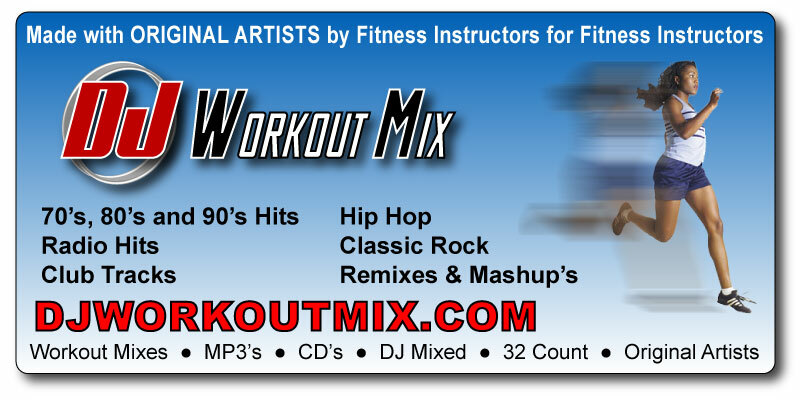 AWESOME HIGH-ENERGY licensed ORIGINAL ARTIST mixes for Aerobics classroom use as well as home exercise, running, and aerobics video music! Yoga mixes also available! Your search for outstanding, energizing, blood pumping, foot stomping music has ended. We have traveled the world to find the best in dance music. Finally a fitness music company run by instructors FOR instructors! We use the music we sell in the classes we teach! Finally - instructor themed shirts. Tell the world that you are proud to be a certified fitness instructor. Be in charge from the moment you step in to the room. 'Instructor character', 'Certified Fitness Instructor' shirts, 'Future Fitness Instructor' and 'My Mommy Rocks' kids clothes. NEW! Now you can request a custom design for yourself or your program - put your name or your club's name on it - customize the instructor character to look like you - whatever you want! Click here to get started. We work with you to help keep your classes full!!! We make new arrangements weekly. You select your speeds. 32 phrasing of course for Step, High/Low, Funk, Hip Hop, and KickBoxing. Cycling, instrumentals, and special arrangements as well. FEDEX overnight shipping available. All styles of the familiar music that your classes want to hear. Email us and ask to be put on our weekly email broadcast list.